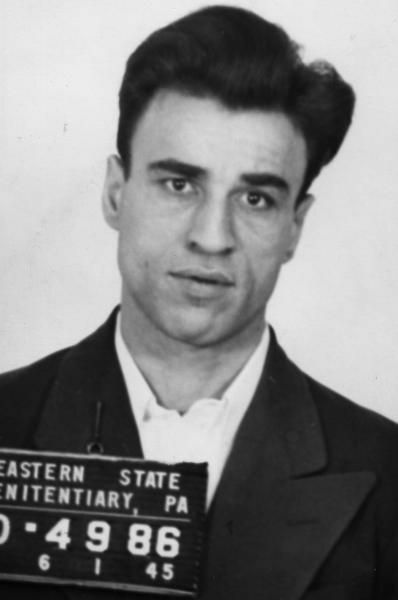 In February 1952 Arnold Schuster, a 24-year-old Brooklyn clothing salesman, became a short-lived hero after he spotted the highly publicized, wanted criminal Willie "the Actor" Sutton, while riding on a New York City subway train. He followed Sutton, notified the police and Sutton was captured. On March 9, 1952, Schuster was found dead on the street where he lived. He had been shot four times, twice in the groin and once in each eye—all the markings of a Mafia murder. Although Sutton had no connection with the Mafia or organized crime, Schuster's death had been decreed by Albert Anastasia, the brutal crime family boss. Watching the new celebrity, Schuster, being interviewed on television following Sutton's capture, Anastasia flew into a screaming rage, not unusual for him. "I can't stand squealers!" he shouted. "Hit that guy!" The murder was carried out by Frederick J. Tenuto, at the time on the FBI's list of 10 most wanted criminals. Tenuto had a police record dating back to the age of 16 and had been in prison several times in the 1930s and 1940s. He was doing a term of 10 to 20 years for the hired killing of a Philadelphia man when he escaped from prison, only to be quickly recaptured. In 1945 he escaped again and was retaken. In 1947 he escaped a third time with four other men, including Sutton. Shortly thereafter Tenuto turned up in Brooklyn underworld haunts where he came under the protection of Anastasia, a man of violence who always appreciated another cut of the same cloth. (If Tenuto had been around when Anastasia was issuing orders to his by then defunct Murder, Inc., troop, Tenuto would doubtless have been one of his star hitters.) Anastasia ordered Tenuto to take care of Schuster. Unfortunately, Tenuto was identified by a witness as he fled the scene of the crime. This made not only Tenuto but also Anastasia vulnerable. Ordering Schuster's murder was a stupid thing for Anastasia to do. Anastasia made amends by ordering Tenuto murdered. Tenuto's body was never discovered although, according to some police informants, he had been given a "double-decker funeral"—being placed in the paneled false bottom of a coffin with an about-to-be buried corpse. The brutal Anastasia had solved his immediate problem, but the Schuster murder was later used by Vito Genovese as a justification for having Anastasia assassinated as a "Mad Hatter," whose irrational deeds were a threat to the entire organization of the Mafia.